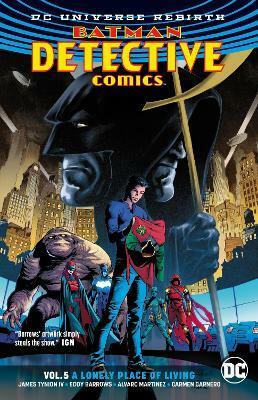 The Dark Knight's team of Gotham City vigilantes--including Batwoman, Clayface and Azrael--continue to protect their home in BATMAN: DETECTIVE COMICS VOL. 5! Having exiled herself from Batman's world, former ally Spoiler has nearly destroyed herself trying to expose the corruption of Gotham City's vigilantes. Fortunately for her, help has arrived...but unfortunately for the city, it's in the form of the mysterious Anarky! Is he truly on the side of the people, or is he a dangerous lunatic? From writer James Tynion IV (BATMAN/TMNT) and the spectacular art team including Alvaro Martinez (BATMAN ETERNAL) comes the newest volume of DETECTIVE COMICS! Collects DETECTIVE COMICS #963-968 and DETECTIVE COMICS ANNUAL #1. James Tynion IV started in the comics business assisting Scott Snyder in writing backup stories for Snyder's groundbreaking BATMAN series. Tynion soon began writing TALON, a series that spun out of the hugely popular "Batman: The Court of Owls" storyline. He has also written Constantine: The Hellblazer and Red Hood And The Outlaws and is currently at the helm of Batman: Detective Comics.